Web meetings are one of the best examples of modern technology bringing untold conveniences to the business world. You can connect groups of clients or business partners across the country and join them within minutes. There is no need for lengthy flights or wasted resources. In order to get the most out of your online meetings, you need a reliable web conferencing service. If you are a business owner in the market for such a service, refer to the list below. Here are the best tools for web meetings. Google Hangouts gets a spot on this list because it is one of the few free web meeting services. All you need is a Google account and you can start taking advantage of its services. Google Hangouts is a video chatting program that can be used to host meetings or share documents. It also has screen sharing features, which is great for webinars. The service offers great video quality and free voice calls. Its free-to-use status does however, leave a bit to be desired in terms of extra features. If you are on a tight budget, Google Hangouts should be your first choice for web meetings. Join.me or Join Me, is another great way to host a free meeting online without having to worry about downloading additional malware security software. The service makes video conferencing as easy as sharing a personalized URL with whomever you want to attend. 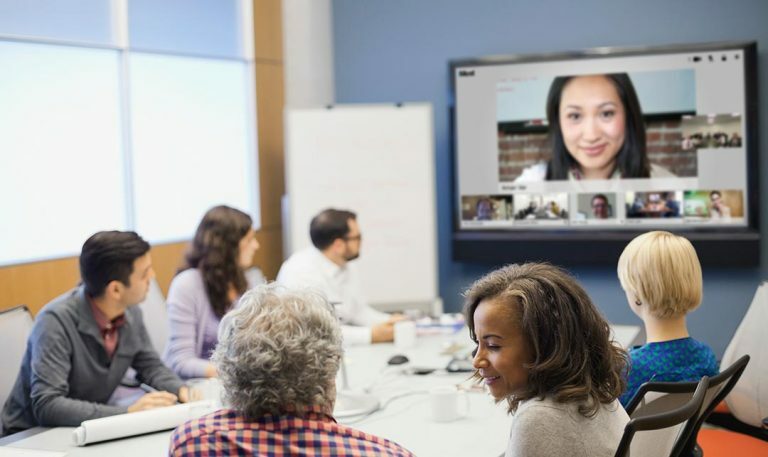 The company provides video conferencing services for individuals, teams and business, so no matter what size your operation, you are sure to find a solution. In addition, Join Me offers screen sharing, mobile, webinar, whiteboard and conference call features. They also provide Slack integration, which is excellent for organizations that communicate with Slack messaging already. If you want a conferencing solution for small business, consider giving Join.Me a try. WebEx is a veteran in the web conferencing sector. It allows you connect via webcam or VoIP. The program has file-sharing features that come with built-in annotations. You can chat with meeting participants through the main window or through private chats. In terms of web meetings, it does everything competently. Unfortunately, its free version limits the number of meeting participants to 3 people. If you want the most out of WebEx, you will want the paid version. Prices run from $19 to $49. Despite this flaw, Cisco WebEx Meetings is one of the best tools for web meetings. GoToMeeting is a premier web conferencing tool designed for businesses to help cut down on memos and the need for office paper recycling services. Its best feature is its ability to connect up to 1000 people per meeting. The maximum number will depend on the plan you choose, which can range from $24 to $109 a month. Every package comes with a wealth of features including HD video conferencing, desktop sharing and mobile app integration. You can claim a permanent meeting URL. This enables your participants to locate your meeting room with a single click. GoToMeeting is the best web meeting tool for business owners with large conferencing demands. Fuze is another free web conferencing service. It has an advantage over its competition in that it supports up to 25 people per meeting. No other free service allows for this many participants. Fuze has all the standard features, including HD video conferencing, audio calling and screen sharing. It also comes with 1gb of free cloud storage. This is useful for document sharing and pulling data for presentations. Fuze has the most comprehensive list of features among free services. It is undoubtedly one of the best tools for web meetings. Web meetings are undeniably useful business tools, as long as you make sure they are secure by avoiding the worst passwords for your account. Your needs however, will vary depending on the size of your business. Small businesses may prefer web conferencing tools like Fuze or Google Hangouts, which are free-to-use. If you have a much larger business, you may want a premium service like GoToMeeting. Consider each of the web meeting tools on this list to decide which is best for your business needs.